20 years ago, Soviet President Mikhail Gorbachev resigned, the Soviet Union ended, and Russia began an imperfect transition to democratic capitalism – a transition that has proven to be far more difficult than expected. And yet the recent protests – somewhat similar to those that preceded the end of the Soviet Union – provide grounds for cautious optimism about the future. So, what lessons can we draw from the successes and failures of Russia’s last two decades of post-Soviet transition? And what lies ahead? The first lesson is that market competition, responsible macroeconomic policy, and private enterprise generally work. Market reforms eventually resulted in historically high growth rates. While high commodity prices played a part, privatised and new enterprises were the fastest-growing part of Russia’s post-communist economy, and the government played an important role by ensuring macroeconomic stability, maintaining a balanced budget, and using oil revenues to create significant foreign-currency reserves. Second, a market economy needs strong political and legal institutions to protect property rights and competition. Such institutions are difficult to build from scratch, and doing so is not merely a technocratic task; it requires political change. Contrary to popular belief, Russia’s reformers understood this challenge from the start. They created a completely new judiciary and tax system, established fiscal federalism, and introduced an independent central bank, an antitrust agency, and many other institutions. But they also knew that these institutions would work effectively only if there was political demand for them – and that this could come only from private owners, a critical mass of which thus had to be created as soon as possible. That is why the reformers rushed ahead with privatisation. But, because privatisation took place before corruption was rooted out, it involved substantial abuses, which undermined popular support for private property. The reformers’ arguments eventually gained ground: most of Vladimir Putin’s reforms during his first presidential term were promoted and even designed by the new capitalists. Private land ownership was introduced, the tax system was streamlined, the business environment was deregulated, a stabilisation fund was created, deposit insurance was implemented, and credit-history bureaus were established. But the unpopularity of privatisation also provided support for Putin’s model of state capitalism. Following nationalisations (both overt and through acquisition by state-owned companies), Russia’s government has since regained control over the commanding heights of the economy. Russia’s state capitalism is different from a planned economy, because government-owned companies are supposed to compete in the marketplace and act similarly to private firms. Critics of state capitalism have always pointed out the risk of government capture by such companies’ managers, which is exactly what has happened in Russia, where the state-owned companies have grown so large that it is difficult to distinguish between them and the state itself. Not surprisingly, government policy has supported these companies through regulation and subsidies, thereby protecting them from competition. Nor is it surprising that these companies failed to eliminate inefficiencies and raise productivity. This largely explains why annual economic growth slowed from seven percent in 1998-2008 to four percent in 2010-2011. Moreover, expansion of state companies drastically reduced demand for market institutions, eliminating corruption and improving the business climate. In the second half of the 2000s, as Russian state capitalism came into its own, previous anti-corruption gains were reversed, and the business climate deteriorated to the point that capital flight now stands at about four percent of GDP. That is a stunning figure, given high oil prices, abundant investment opportunities, and the nearly moribund US and European economies – the main recipients of Russia’s fleeing capital. In short, the third main lesson of Russia’s transition is that state capitalism does not work (at least not without a strong meritocratic political party, as in China). Indeed, recent events have shown the system to be inherently unstable. As market reforms have brought substantial prosperity (average annual per capita GDP, at purchasing power parity, is now $17,000), a large middle class, based mostly in small and medium-size companies and the service sector, developed beyond the reach of the state-owned behemoths. Most of this middle class also lives in large cities – where the battle for Russia’s future is now taking place. The demands of this middle class have become crucial. Its representatives understand that they must win the battle against corruption or leave the country, as they would have no future in Russia otherwise. That is why they have rallied around the young blogger Alexei Navalny, whose WikiLeaks-like anti-corruption campaign has brought forth evidence of billions of dollars stolen from state-owned companies, luxury limousines bought by officials, and spectacular business careers by the ruling elite’s “wunderkinder” sons and daughters. The evidence of corruption produced by Navalny, and the nickname he gave to Putin’s political party, United Russia (the “party of crooks and thieves”), was perhaps the single most important factor underlying United Russia’s loss of its parliamentary majority in December’s general election. Moreover, massive electoral fraud galvanised middle-class grievances, driving tens of thousands of protesters into the streets. 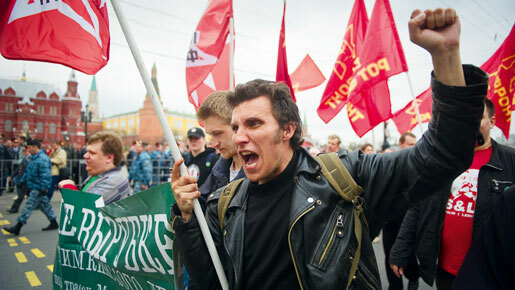 Ironically, the wave of protests since then is consistent with the “modernisation hypothesis” that Putin’s government has always used to justify the rollback of democracy in Russia: democracy is sustainable only if society is sufficiently well-off and has a solid middle class; until then, centralised rule is needed. Now, it seems, sufficient prosperity has arrived, calling forth a middle class solid enough to demand government accountability, proper rule of law and a genuine fight against corruption. Whatever happens in the March 2012 presidential elections, the political mobilisation of the middle class will eventually lead to democratisation.